2012 G40 part 3: Making of "Hip-Hop Meditation Station"
Here's a behind the scenes look at the recent art installation by PONSHOP. Thanks to all our collaborators on this project: Crystal and Kevin Rodrigue of Rodrigue Studios for their design/build consultation, Adriana Christesen, Jasmine Lee, Sidney Mullis and Janet Hahn for their research and studio support, Jeff Gulick for the on-site installation assistance and Christopher Stuart for video work. Special Thanks to Art Whino and RVA Magazine for hosting the 2012 G40 event. G40 runs through May 5. 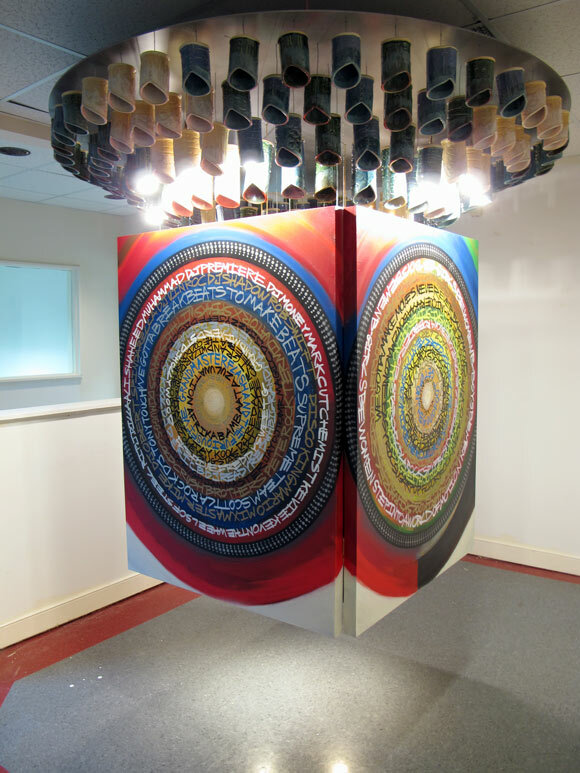 "Hip-Hop Meditation Station" ceramics, and mixed media panels, 72" diameter x 60" height suspended installation, $8,000 USD. On exhibit at the 2012 G40 Summit hosted by Art Whino. This installation can be reconfigured to accommodate a variety of spaces, contact us to inquire about design variations. Scarlett and I are excited to be participating in the 2012 G40 Summit in Richmond, Virginia. Honestly, this has been the most ambitious project that we've collaborated on to date and we're proud to be exhibiting it in this month-long exhibition. Below are some pictures showing the progress of creating the ceramic forms (a total of 166) as well as installing the piece in the space at 101 West Broad Street. The installation, titled "Hip-Hop Meditation Station" is a visual chronicle of the Hip-Hop culture, charting each of the four elements of Hip-Hop (DJing, MCing, B-Boying and Graffiti Art) throughout the course of the time. Each art panel charts the trajectory of Hip-Hop's progression by listing those who have impacted the movement through their involvement. This chronology is by no means complete, but offers up a brief history lesson for younger generations on the birth of an American art form that went on to in influence the world. The G40 Summit opens Friday April 6, 2012 and includes over 500 artists as well as several recent large-scale outdoor murals by international artists. The G40 Event runs through the month of April with a closing party on May 4,2012. For more information, visit Art Whino. Special Thanks to Art Whino and RVA Magazine for hosting the 2012 G40 event. Also PONSHOP would like to thank our collaborators and student interns for their assistance throughout the past two months: Crystal and Kevin Rodrigue of Rodrigue Studios for their design/build consultation, Adriana Christesen, Jasmine Lee, Sidney Mullis and Janet Hahn for their research and studio support, Jeff Gulick for the on-site installation assistance and Christopher Stuart for video work.